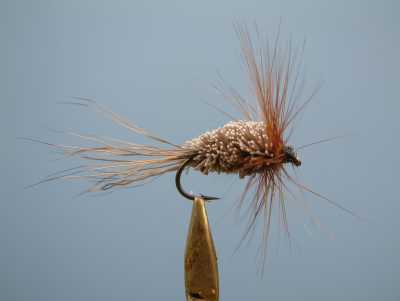 Tom Sutcliffe is the originator of this fly which was named after Bill Duckworth who had considerable success fishing this fly in the Dargle area. Hence the name Duckworth’s Dargle Delight. Take a small clump of Deer hair and tie in a tail.Take a larger clump of Deer hair remove fluff and spin just ahead of the tail. Repeat this step 3 to 4 times leaving enough room for the hackle and head. Remove from the vice and trim the deer hair to a cone shape. Make sure to trim very short under the hook shaft to expose the gape of the hook. Tie in the hackle by the base and wind forward in 4 even turns stroking back between turns. Tie off and trim just behind the eye. When forming the head pull the hackle fibers back and trap at the base with a few loose turns. The hackle fibers must lie back against the body.